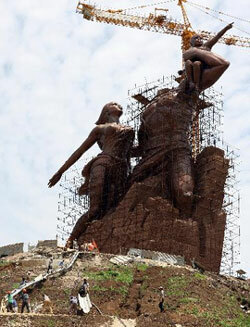 A giant bronze monument named "African Renaissance" is being made in the Senegalese capital of Dakar by a North Korean design company. The Mansudae Overseas Project Group of Companies is due to complete the monument by April to mark the 50th anniversary of Senegal's independence from French colonial rule. Standing at 50 m tall, the piece will tower over the 46-m Statue of Liberty in New York. The Wall Street Journal reported the reason why a project that symbolizes Africa's march to freedom and independence was commissioned to one of the most dictatorial regime on the planet is that North Korean monumental sculptures "are big, simple and cheap."